Wish that you had extra counter space? Want to add some additional storage to your kitchen. The Townsend Rustic Brown finished island can help. Made of acacia veneers and solids, this sturdy kitchen island will add decoration to your space as well as function. Whether you choose to place this piece in the middle of a large open kitchen or off to the side in an eat-in breakfast nook, it’s sure to bring elegance into your home. The decorative details include turned bun feet and dentil moulding around the apron of the island's top. An expandable drop leaf on one side allows you to use the piece in correspondence with counter height chairs as a coffee bar. Storage includes five drawers, three open storage compartments and enough wine storage for 5 standard sized bottles. Use this piece in traditional, rustic, industrial, classic Italian and French laundered styled rooms. 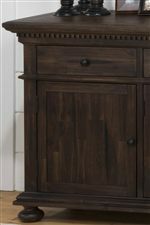 The Geneva Hills Kitchen Island with Drop Leaf, Wine Storage and Drawers by Jofran at Furniture Barn in the Pennsville, Bear, Newark, Hockessin, Middletown, New Castle, Townsend, Talleyville, Wilmington, Marshallton, Smyrna, Elkton, area. Product availability may vary. Contact us for the most current availability on this product. The Geneva Hills collection is a great option if you are looking for Traditional furniture in the Pennsville, Bear, Newark, Hockessin, Middletown, New Castle, Townsend, Talleyville, Wilmington, Marshallton, Smyrna, Elkton, area. Browse other items in the Geneva Hills collection from Furniture Barn in the Pennsville, Bear, Newark, Hockessin, Middletown, New Castle, Townsend, Talleyville, Wilmington, Marshallton, Smyrna, Elkton, area.